Oh Snap! The Friggin Amazing J.Ho Sketchblog...: DUCK WEEK PART 1: Blathering Blatherskite! DUCK WEEK PART 1: Blathering Blatherskite! Welcome to the very first Bootleg Sketch Mega-Event(TM): that's right, it's Duck Week(TM)! What does that mean? It means that I'll be drawing ducks this week. Yes, that's right, ducks. I stuck with my own style and I changed a few details here and there, but this is still a pretty straightforward interpretation. Incidentally, if it's not obvious, Gizmo Duck is supposed to be screeching to a halt. I'm happy with my color selections, though the shading, such as it is, is very basic. The background color was a last minute addition to distinguish Gizmo Duck's white armor from the white background. Check out the other entries in Pencil-Ninja's jam at this link, and stay tuned for more DUCK WEEK(TM), including a bonus review on Wednesday and another Duck-Sketch on Friday, right here, on this very Blog! BELIEVE IT! A cyborg! Finally! Now if only you'd do that cyber-centaur I suggested oh so long ago. The drawing is tight. It's got a central composition without being stale. It's actually quite dynamic. My eye flows the length of the body (I'll wait til u stop snickering... ready? ok) then out along the squealing tire smoke and back up to Gizmo's body. Very good composition. KEEP THAT EYE MOVING! Now, if you'll excuse me, I have to go run around in circles to expend this fanatic and frenetic energy that builds in me when speaking on cyborgs and robots. "Our next stage of evolution will not come from outside influences, will not be caused by natural mutation, but by conscious human choosing as we amalgamate our machines into ourselves and become less like homo sapiens and more like homo machinae." No Duck Week is complete without Howard the Duck! Right?! Right??! I hate DuckTales. And by hate, I mean love. And by love, I mean love dearly. Nice work, sir. Bubba next? Nice one J. You captured all the quirky coolness of this character. It took me right back to 5th grade (ooh maybe remembering those years isn't the best idea... I'll just focus on the cartoons... ah yes, that brings a smile) Now if week could only get a Launchpad McQuack outta ya. 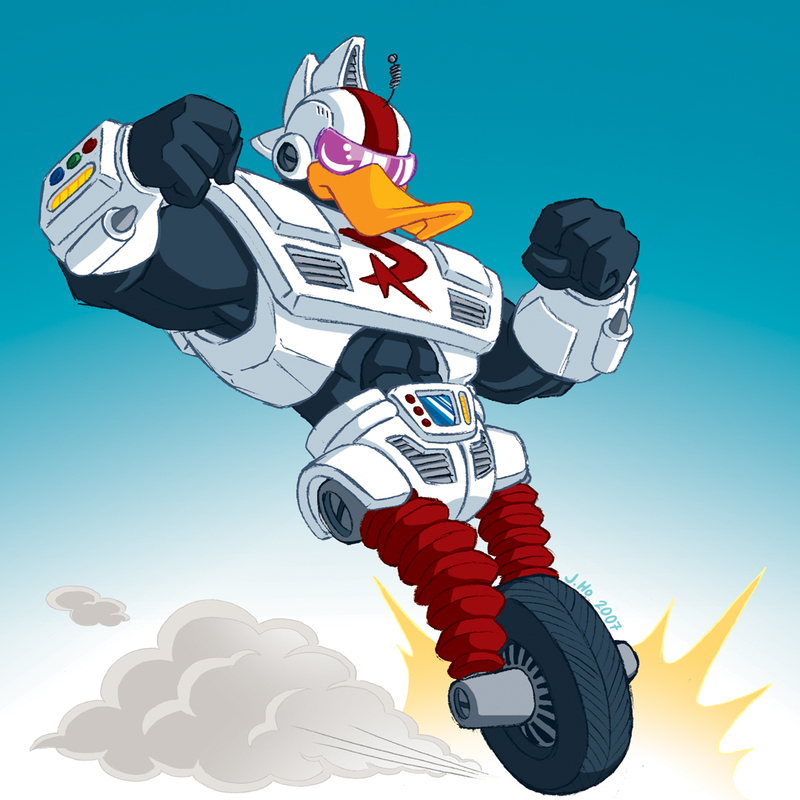 What an Awesome pic of Gizmo Duck! I love it J. Awesome work. lord shen: wow, thanks man, ya crazy robo-phile! nathan hamill: BUBBA! yes, i will draw bubba, maybe retrofit him in with the justice ducks. of course his triceratops tootsie will be in there as well. jamilyn: thanks man, and yes, launchpad will go in with the rest! 2-bad: thanks dude, glad you liked it!